3 - 3................Bingo von Ellendonk. 4,4 - 5,5..........Satan von Ellendonk. 4 - 5,5.............Blanka von der Au. 5,5,5 - 5..........Chico von Forell. SchH 1: 100-96-90 = 286 points (07-10-1995). Cocoa von Warringhof passed the ZTP with highest possible rating for protection, courage, fighting spirit and self-assuredness and high hardness under Ottmar Vogel in Germany. She passed her Schutzhund 1 with a score that was V rated and pronounced in protection. Her sire, Bingo von der Weyermühle, and dam, Dunja vom Worringer Bruch, both passed the Körung 'for life' with highest possible ratings for hardness and working drives (very high protection, fighting spirit, courage and hardness with middle sharpness). Cocoa lived to 8 years of age, her sire to 10 years of age and her dam to 11 years of age. Alfa: SchH 3, FH, D.V. Meisterschaft multi-participant and passed the Körung 'for life' with highest possible ratings for working drives and hardness (very high protection and fighting spirit, courage and hardness with middle sharpness) and V rating. She is dam of the von Warringhof “D, F, H, J, L” litters (Janka, Hel). Aisha: SchH 3 and passed the Körung 'for life' with highest possible ratings for working drives and hardness (very high protection and fighting spirit, courage and hardness with middle sharpness) and V 1A rating. Cöbes: SchH 3, D.V. Meisterschaft participant and passed the Körung 'for life' with highest ratings for working drives and hardness (very high protection and fighting spirit; high courage and hardness with middle sharpness) and V 1A rating. He is sire of the vom Eschenbruch “A, B” litters (Avanti, Banjo, Ben) and von der Schwellenburg “O” litter (Odett). Cher: IPO 3 and passed the ZTP with 1A rating for character and SG for conformation. She is dam of the von Warringhof “I, K, M, O, P” litters (Kalina, Orka, Phil, Pilar). Allee: SchH 1 and dam of the vom Blitzkrieger “C, D, F, L” litters (Dax, Faroh, Lazer). Aisin: SchH 3, FH 2 and dam of the vom Tanzenhaus “A” litter (Angriff, Andie). Baron: SchH 2 and sire of the vom Blitzkrieger “I” litter (Icaro) and Hundesport “D” litter (Dex, Dunja). Boghart: SchH 3, FH 2. Bella: dam of the vom Blitzkrieger “E” litter (Eick). 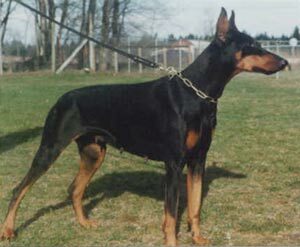 Bo: dam of the vom Blitzkrieger “G” litter (Gorbachov). Bren: dam of the vom Blitzkrieger “H” litter (Hagan, Hakim).